I promise I’m not crazy. Let’s just get that out of the way before we talk about this recipe. I know it’s not healthy. I know that kids shouldn’t be taught to eat like this, but I also know that once a year you should do something totally awesome and blow everyone’s minds with breakfast. 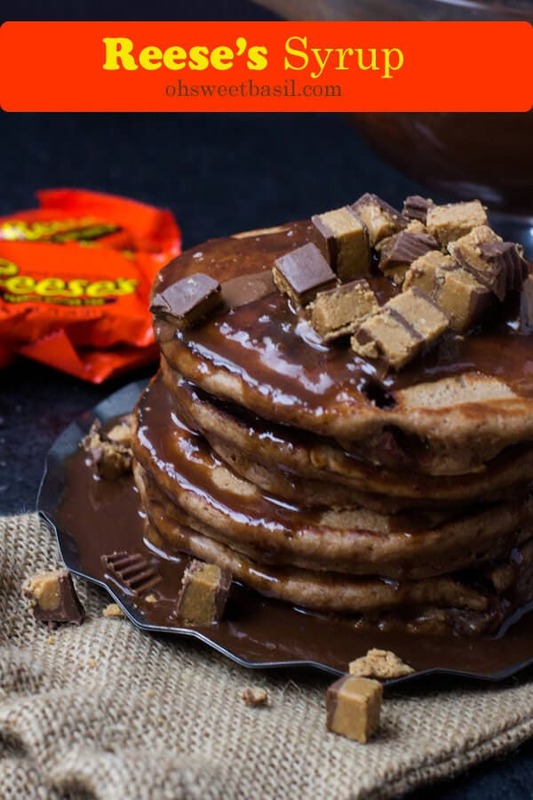 I mean, who could say no to reese’s syrup over double chocolate pancakes?! 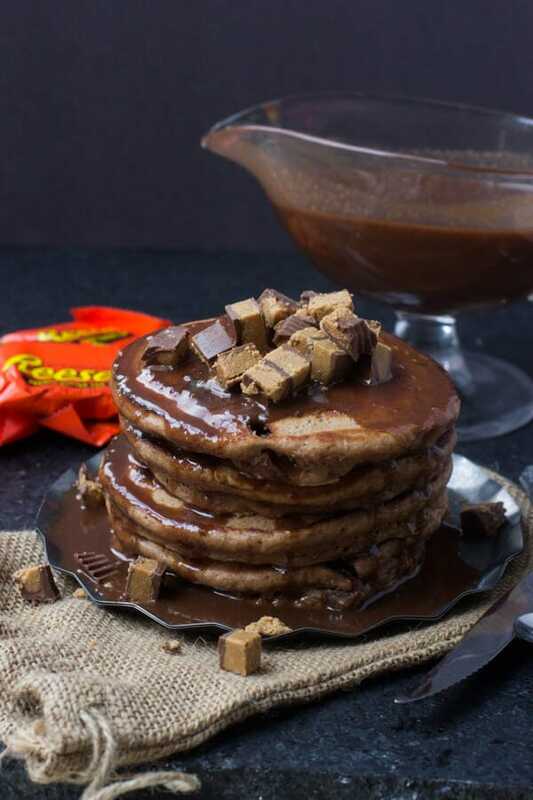 If it makes you feel better you can always serve this Reese’s Syrup over multigrain chocolate pancakes. Then it’s at least a little healthier. But I mean, that’s totally up to you. Oh good mercy. This stuff is all kinds of awesome. I really don’t even know where to start. I mean, it’s chocolatey, it’s peanut buttery, it’s creamy, it’s delicious. Can’t you just picture sopping up all of that chocolate syrup with your fluffy, double chocolate pancakes right now? It’s pure heaven. 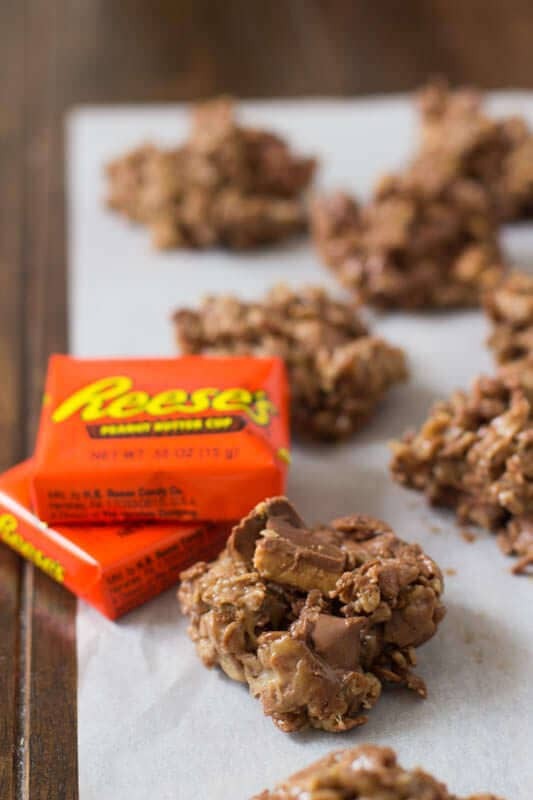 And before you move on to the recipe, don’t forget to go pin everything from our Monday post because we’ve teamed up with Hershey’s and some of your favorite bloggers to bring you must make treats of the season! Remember how on Monday I posted one of our new favorite treats? 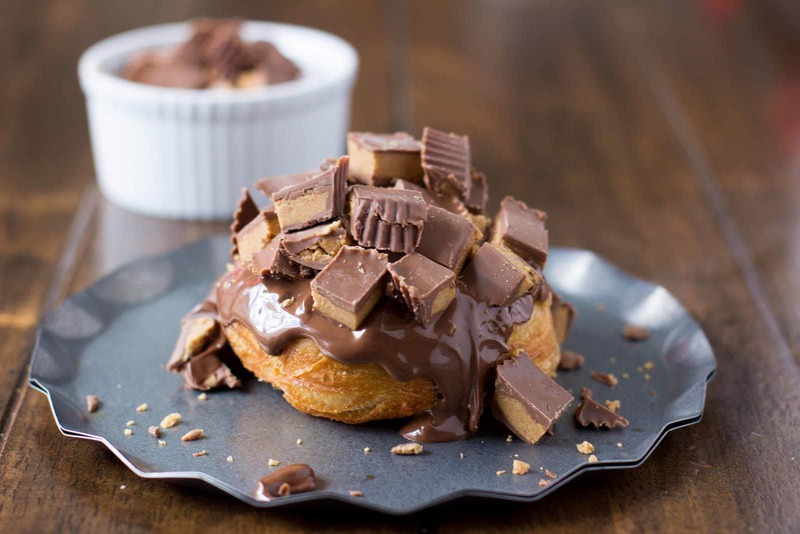 The Reese’s Mississippi Mud Bites that are the ultimate dessert? 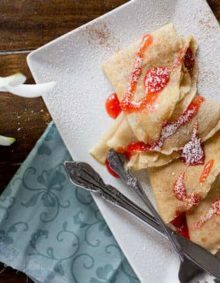 Well, I just loved everything that everyone came up with for the must make this holiday season and this little recipe is another you absolutely have to try. 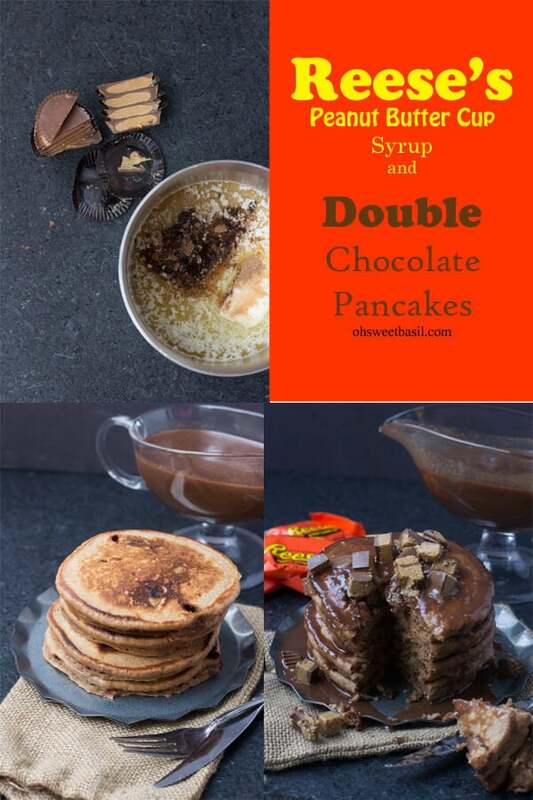 The pancakes are lightly flavored with chocolate and have little chocolate chips all throughout them which makes them deliciously double the chocolate pancakes. What is it about those dang peanut butter cups?! Seriously, I cannot resist them. 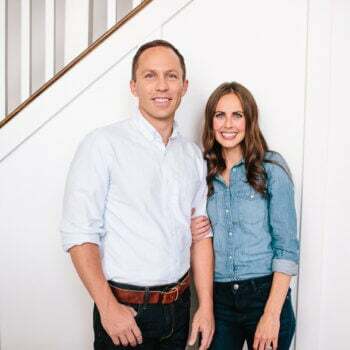 I actually feel the most inspired by them. Which is a little sad as it’s just candy, but every time I make a recipe with them I think up 10 more that I just HAVE to make. Which is good because Reese’s is still the number one searched for keyword on my site. Don’t believe me? Just check out the additional recipes I’ve listed at the bottom and pin them all until you’ve tried every single one. And it’s not just the peanut butter and chocolate flavor combo. Nope, there’s something lovely about the texture too. The peanut butter in particular. Right? Go eat one and just try to tell me you don’t notice. Can Pancake Batter Be Made Ahead? Pancake and waffle batter can be made the night before. Because baking powder may lose some of its potency overnight, you may want to add a little more. Let the batter warm up a little, give it a stir, and cook your pancakes. Not enough soda will result in a blonde, flat pancake. Too much will result in a tall, dark, soapy-tasting pancake. 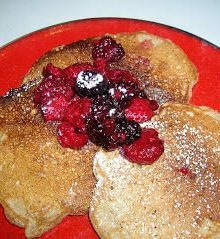 Also, if you over-mix, the gluten will develop from the flour in your batter, making your pancakes chewy instead of fluffy. Stir just until the flour is incorporated. You will still have some lumps of flour in your batter. There are several ways to reheat pancakes. You can pop them in the toaster. 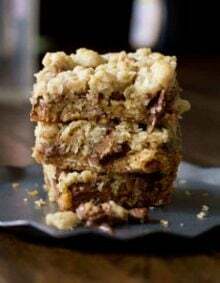 They can be reheated in the oven by placing them on a baking sheet and covering them with foil. You can also microwave pancakes for 15-20 seconds at high setting. Set aside until the syrup is ready. When you are ready to cook the pancakes, spread a little butter over a pan heated to medium heat. Pour out the pancakes into individual circles and allow to cook for a few minutes until the bubbles begin to form on top and begin to pop. Flip the pancake and cook until golden. 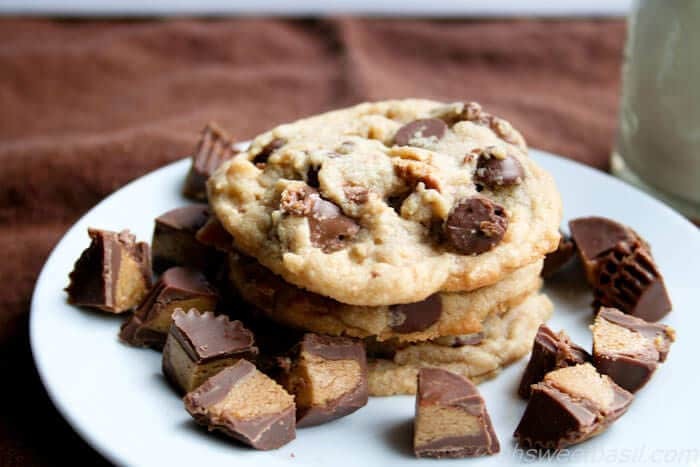 Pour all ingredients except the reese’s peanut butter cups into a large sauce pan and cook over medium heat until it boils. 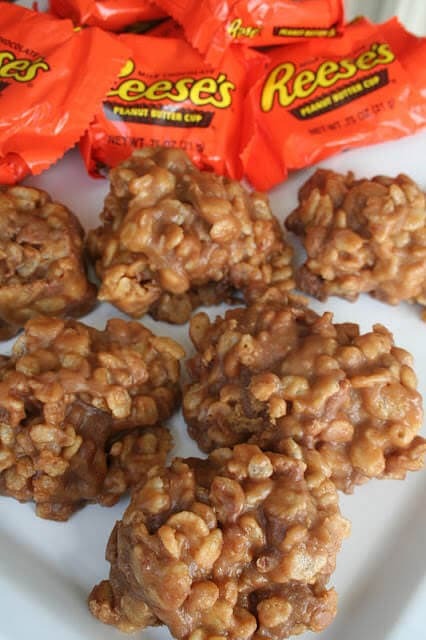 Remove from the heat and stir in the Reese’s, continuing to stir until the candy melts down completely. Serve immediately. Have you ever tried making the batter the night before? I’m trying to avoid too much kitchen time on christmas morning! Alicia, I have and it didn’t hold up very well, but maybe it was just one bad time for me. I’ve just been to scared to try again. The syrup I’ve made ahead and reheated, and then had the flour in one bowl with saran wrap, and the wet ingredients in a bowl ready to be whisked in the fridge to save time. Holy moly. I need these asap. Wow! 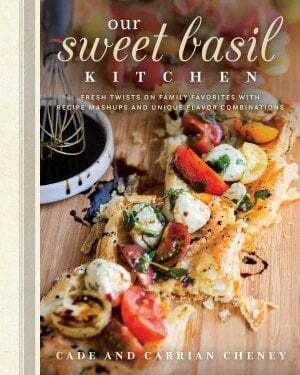 This recipe is incredible, so indulgent 🙂 I am loving it! BECAUSE %^^%$&&! WOMAN!!! ahhhhhhhhhh! THESE ARE THE YUMMIEST PANCAKES IN THE HISTORY OF EVER!!!!!!!!!!!! lol, I love your enthusiasm. 😉 and hooray for engagements!! LOVE this! My kind of breakfast! You are amazing. And I love you. And you are not alone, Carrian. I cannot (100% impossible) resist peanut butter cups! the best dang candy creation out there! Seriously!! These are amazing. I mean, is there anything better? I think not! Pinned! I am out of words right now, and that doesn’t happen often. 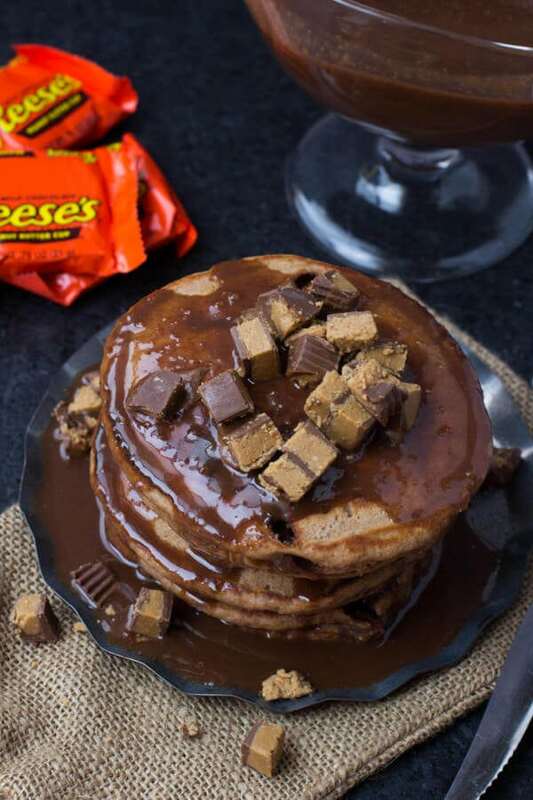 I am a peanut butter cup and pancake addict. These are seriously everything I could ever dream of having for breakfast. 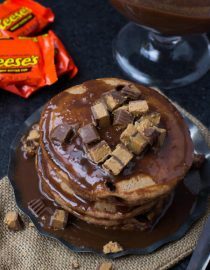 And, reeses syrup? That is the most genius creation ever to happen to planet Earth. 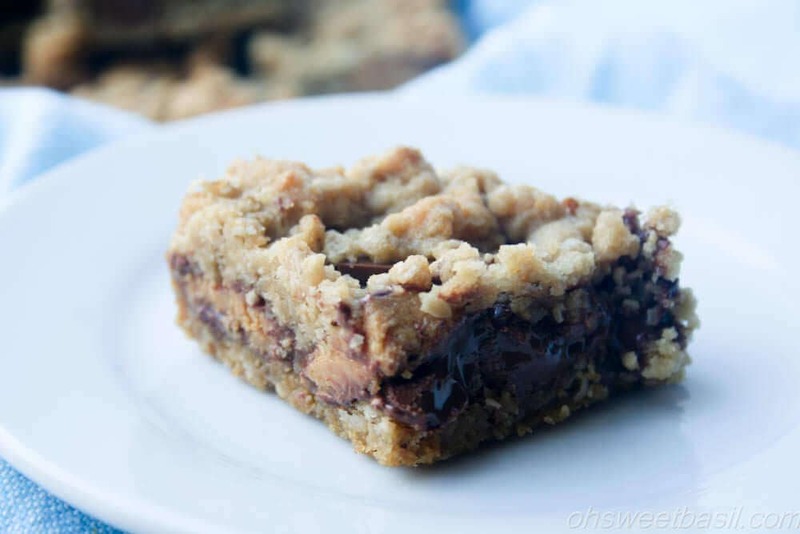 These look ah-may-zing! Pinned!